Websites That Help You Track Your Spending, And Saving One of the benefits of the online services, a personal finance expert says, is to help users save toward a goal — like buying a house, or taking a long vacation. Personal finance websites allow their users to track even small expenses — such as coffee-shop visits — and set savings goals, like paying for a long vacation. Personal finance websites such as Mint.com have gained fans for helping people sort out where their money goes. They can be a great way to track your savings, says Joan Goldwasser, a senior reporter for Kiplinger's Personal Finance. Other than Mint, those wanting a free, Web-based personal financial management service can turn to Thrive, Money Strands and Buxfer, Goldwasser tells NPR's Renee Montagne. The sites combine their members' banking, credit card and brokerage accounts into one composite picture by accessing those accounts online. To do that, members must share their account information, like user IDs and passwords. In return, they get an itemized view of their money. One of the benefits of the services, Goldwasser says, is their ability to track spending and to help people save toward a goal — like buying a house, or taking a long vacation. For instance, someone wanting to buy a house in five years "can put down how much you think you're going to spend on this house, and it will help you figure out what percentage down payment is reasonable, and then how much you need to save each month — so that in five years, you will have the money for the down payment." 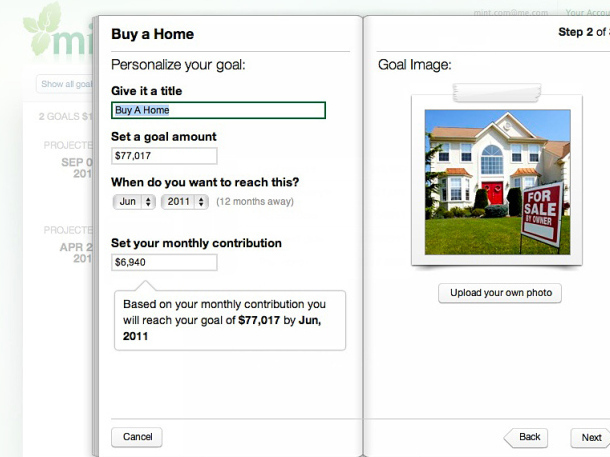 A screenshot shows how a Mint.com user can set up a budget to save for a house. And for anyone planning a vacation, Goldwasser says the services can help them save up for the trip, "so I can go out to eat and do whatever I want to do and not have an enormous credit card bill when I return." Of course, to many people, handing over access to their financial life sounds like a huge security risk. To combat that, Goldwasser says, most of the personal finance sites promise "bank-level security." "Most of the sites don't actually store your information," she says. "They do what's — the technical term is 'screen-scraping.' So they go to the bank's website and sort of pull the information in, but they don't store it themselves. So it's a little bit safer. But you obviously have to be comfortable with having information online." And Goldwasser has some advice for anyone using a smartphone app from one of the services. "You do want to be careful that you don't look at personal information in a public Wi-Fi spot," she says, "because that can be a little bit risky."